Recalling old arcade shooters like Mad Dog McCree, Wild West Guns is a gallery/rail shooter for the iPhone. Utilizing the iPhone’s touchscreen instead of the iconic arcade lightgun, Wild West Guns is a clever adaptation of a dated gaming genre. While it’s a fun homage to old shooters, the game’s content is thin and the overall experience falls short of Gameloft’s typical high quality. 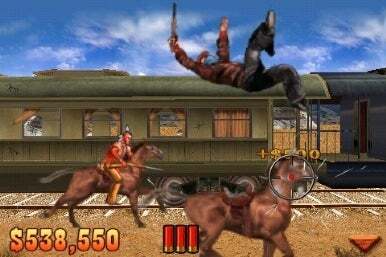 You'll need to shoot bandits and other bad guys as they try to rob a train. Each of the six levels is divided into three parts. The first two parts of each level are shooting galleries where you’re tasked with hitting targets, balloons, vultures or flying sombreros. You get more points for shooting targets in combination — these range depending on the level, but can include hitting like-colored balloons in quick succession and not breaking a combo through missing or being shot by the sporadic enemy that appears on the level. You won’t experience too many enemies in the shooting range areas, but they provide a constant specter to watch out for. After you complete the shooting gallery levels, the game introduces a bandit stage to finish the level. These feature the standard Wild West archetypes in full ridiculously stereotypical form — sombrero-toting Gauchos? Check. Native American warriors on horseback? Yep. Innocent bystanders dressed as burlesque girls? You betcha. These enemies will pop up from windows on trains, behind bars, and peer out of doorways to shoot you. You get points for shooting them quickly without giving them time to shoot you; you get even more combo points if you get headshots. On the later difficulty levels, you only have a small amount of health so dispatching your foes quickly is paramount. The load screens between levels feature funny western sayings and helpful hints on how to advance in the game. Learning how a rat problem has contributed to a shortage on socks may seem innocuous, but if you manage to see any rats in the levels you get major points for shooting the vermin. The maps of the first three levels are fairly diverse — desert, churchyard, train, saloon, etc. But these are then repeated for the next three levels and for the higher difficulty settings, so memorizing your enemies’ attack patterns becomes pretty routine. The backgrounds look 3-D even though the most of the action occurs on a 2-D plane. Two of the bandit levels are shooting galleries while the third, the train level, is a simple rail shooter. There are some small details that you might miss the first play through that I later appreciated. In addition to the usual cast of enemies, the “mad scientist” who comes at you with exploding TNT is a pretty fun addition to the genre. I also liked that the iPhone shook to simulate the recoil of the shotgun and machine gun powerups. And shooting the vultures and prairie dogs to protect the bunnies is a pretty silly, but funny stage concept. Unfortunately, the game will take you about thirty minutes to complete on normal mode and the unlockable levels are simply more difficult — but not different. The replay value of the game is extended only by increased difficulty, a restriction on ammo, and the introduction of health as a limiting factor. Players who don’t mind the predictable gameplay and short playing time may find Wild West Guns a worthy addition to their iPhone arsenal. There are some genuinely fun moments here and I must applaud once again Gameloft’s use of the iPhone platform to create an intuitive gaming interface. But ultimately the game is too thin, too stale, and too predictable to warrant more than a few minutes of your time. A lite version is available, to give you a taste of the game for free.